admin | Transport Equipment Inc.
My spare-bedroom office in Delaware, Ohio, faces the main entrance to the county fairgrounds, whose national claim to fame is harness racing and the annual Little Brown Jug competition. Harness racing, also called trotting, uses Standardbred horses, so I see a lot of horse-hauling rigs go into and out of the grounds at all hours of the day and night. Most are small to medium-size units pulled by heavy duty pickups. 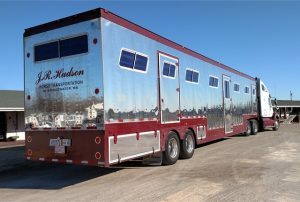 This morning I saw the largest and sharpest horse trailer I can remember. It was big-rig size, and its polished metal sides glistened in the sun. I had to go see it, and had no excuse not to because it takes me all of five minutes to drive from my garage to the stables area on the fairgrounds. Read more at Trucking Info.